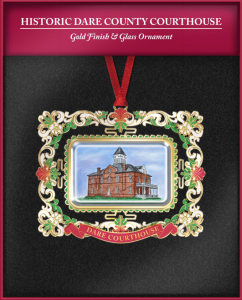 We’ve designed a beautiful commemorative ornament that will be on sale at these Roanoke Island locations: The Elizabethan Gardens, White Doe Inn, Museum Shop at Roanoke Island Festival Park and Dare County Arts Council. You may also purchase online and have it shipped to you through the USPS. Discounted prices available for purchases of 10 ornaments or more. Please call 252-473-7336 or email mpt27954@gmail.com for more information on discounted prices. This ornament is produced by Design Master Associates, Inc., a company that has created famous White House ornaments, and retails for $22.